Azerbaijan may export pomegranates to four EU countries - Germany, France, Latvia and Poland. This was stated by secretary of the Association of Manufacturers and Exporters of Pomegranate Shahin Hasanli. Negotiations are underway in this direction, the conclusion of contracts is expected, he stressed. The representative of the association noted that this year the growth of exports of pomegranate is projected at 20-25 percent compared to the previous year. Currently, the main export destination of the Azerbaijani pomegranate is neighboring Russia. The potential export markets are Germany, France, Latvia and Poland. Today, there is a strong competition in European market, which is mainly provided by North Africa and Southern European countries. Despite this fact, Azerbaijani fruits, which are distinguished by being organic, can take a worthy place in the European market. The Pomegranate Producers and Exporters Association was established on October 31, 2016. The Association includes more than 20 members. The aim of the Association is to provide services and support to farmers interested in growing pomegranate, as well as promoting the pomegranate within the “Made in Azerbaijan” brand throughout the world. The Association regularly represents pomegranate in local and international markets, strives for an even greater use of advanced technologies in production, supply of high-quality raw materials and improvement of existing experience. Pomegranate is one of the most nutritious fruits on earth. It contains a wide range of nutrients, unsurpassed by other fruits. Many studies have shown that they have incredible benefits for the body, and can reduce the risk of all sorts of diseases. More than 60 varieties of pomegranate are grown in Azerbaijan. Now the area of gardens is 23,000 hectares. 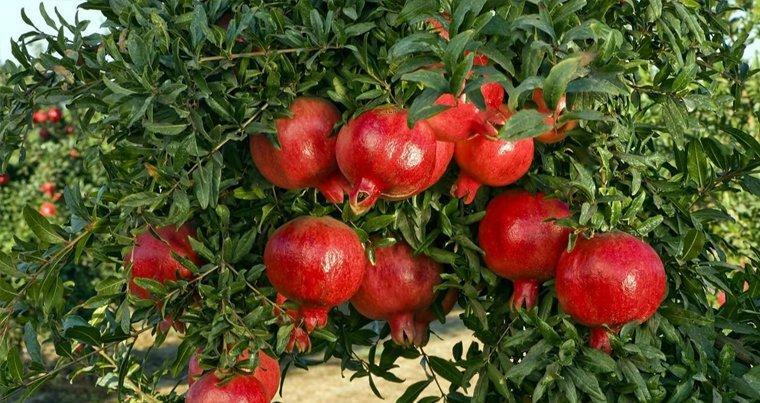 The Azerbaijani pomegranate has received worldwide recognition as one of the best. The secret of the magnificent taste of Goychay pomegranates is a unique microclimate and fertile soil. Pomegranate contains from 8 to 19 percent of glucose and fructose, from 3 to 7 percent - citric acid, a large number of minerals, vitamins, fiber, and pectic substances. This fruit is very rich in antioxidants. Pomegranate juice improves appetite, treats anemia and other diseases. In Azerbaijan, pomegranate is called the king of fruits. A pomegranate tree is spread all over the world, and Azerbaijan is the only country where all varieties of this royal fruit grow. The climate of Azerbaijan is surprisingly diverse, and this is what facilitates the cultivation of all kinds of pomegranate.